Along with the repurposed Seaholm Power Plant, the new condo tower and low-rise commercial building frame a public green space. The stair to the below-grade parking garage is adorned with “Golden Afternoon,” an interactive art installation by Brooklyn-based Urban Matter, which was commissioned by Art in Public Places. Photo by Casey Dunn. New streets were added as part of the project, connecting the site with Austin’s downtown urban grid. The bend in the Missouri Pacific Railroad creates quite a squeak when trains go by, 17 times per day, motivating the architects to provide acoustic protection to both public and private areas. Photo by Casey Dunn. 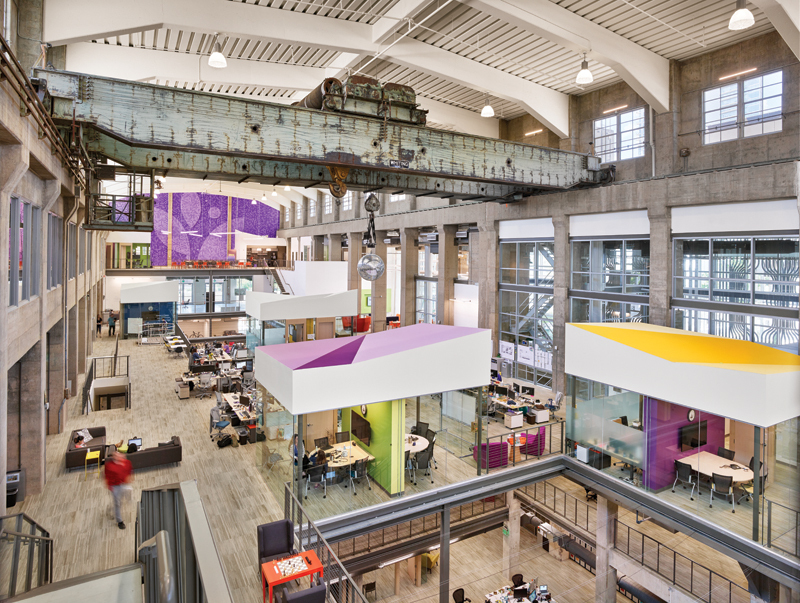 The interior of the Seaholm turbine hall is now the corporate offices of Athenahealth, designed by Charles Rose Architects. Photo by Casey Dunn. The condo tower’s amenities area and pool deck provide sweeping views to the south and west. Photo by Casey Dunn. Seaholm’s Art Deco design represents the end of an era of civically embodied power plants. Photo by Casey Dunn. The low-rise commercial building at the northwest corner buffers the central plaza from the noise of passing trains. Acoustical glass was used in the tower’s west face. Photo by Casey Dunn. At the end of World War II, Austin was a city of 138,000 people and was quickly outgrowing its 19th century power infrastructure’s capacity to supply an adequate amount of electricity. The population was swelling, as were its inhabitants’ individual demands for energy, this latter fed by a booming national economy and a sudden profusion of household appliances. The Seaholm Power Plant was commissioned in 1948 to satisfy this newly created appetite. Erected in two phases — the first completed in 1951 and the second in 1955 — the facility was named after Walter E. Seaholm, a municipal administrator who played a vital role in upsetting a 1927 bid by the privately held Texas Power & Light Company to take over the city’s power generation. (Austin has held this utility since electricity first appeared in these parts in 1893.) Kansas City engineering firm Burns & McDonnell designed the plant, taking some care with the architecture of the turbine hall, whose cast-in-place concrete structure is well-proportioned with some minor Art Deco flourishes. 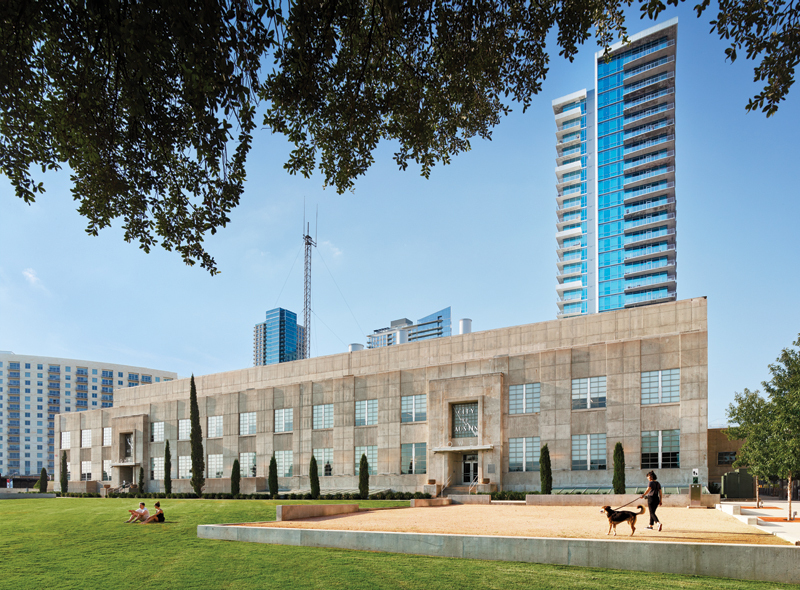 Symmetrical and stately, looking every bit the civic edifice, with Italian cypress trees punctuating the human-scaled facade, it sits today beside downtown put to a different purpose, gazing upon Lady Bird Lake across a manicured lawn. In 1989, Seaholm spat out its final watt of energy. Old and inefficient for a power plant, it had long since been outmoded by a larger, remotely located, less civically embodied facility. 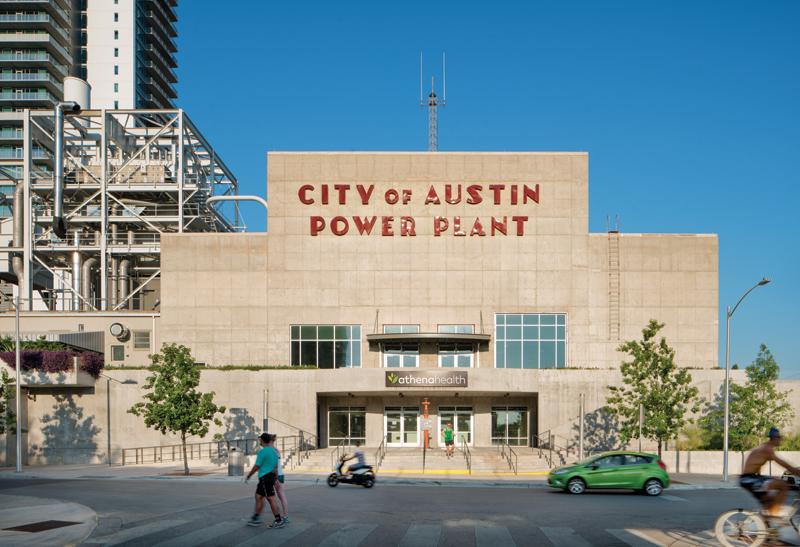 But though the turbines ceased turning at this point, it was the beginning of a new life for the building in the minds of the people of Austin. When the city raised the possibility of demolishing the structure and redeveloping the site, the community objected strongly enough to stay the wrecking ball. 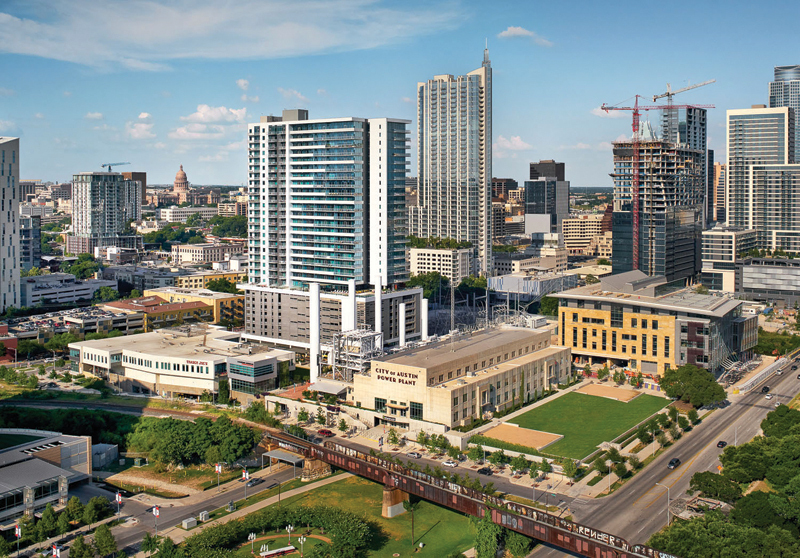 In 2000, the City of Austin drew up a redevelopment master plan for the seven-acre site, and, in 2004, released an RFQ outlining a public-private partnership. The city’s infrastructure plan established a tax increment refinancing zone, remediated and stabilized the plant, moved utilities, and added roads to tie the disconnected plot into the city street grid. This reduced the developable area to five acres. 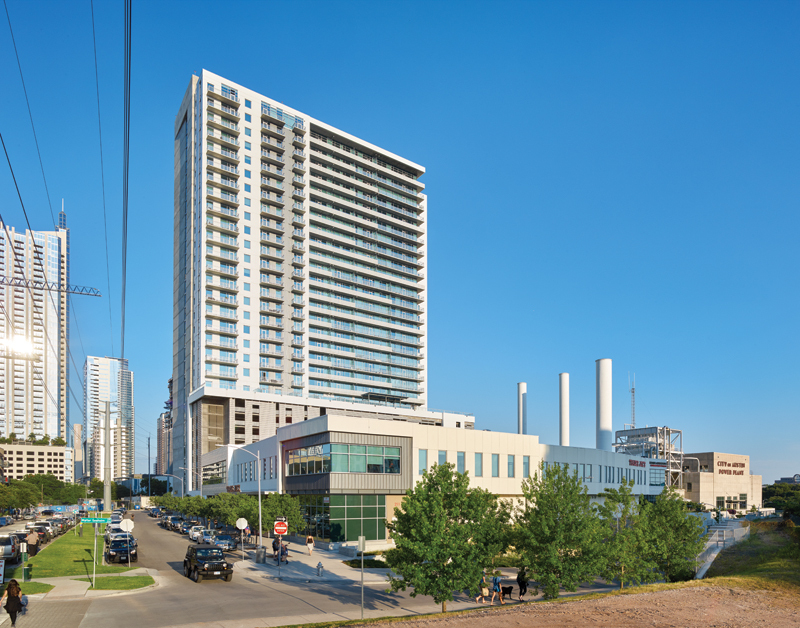 Seaholm falls within a Capitol view corridor, which restricted vertical density to the northeast corner, where the tower — the prime economic engine — now sits. The city also set up a profit-sharing clause whereby, when a developer sold out their interest, if over a certain return on investment was earned, the city would recoup the money it put into the project. Seaholm’s Art Deco design represents the end of an era of civically embodied power plants. The initial scheme located offices and a hotel in the tower, apartments in the low-rise structure, and retail space in the turbine hall. After the crisis, the program was rearranged: Apartments were located in the tower, retail and commercial in the low-rise structure, and a corporate headquarters — the offices of Athenahealth, designed by Charles Rose Architects — in the turbine hall. 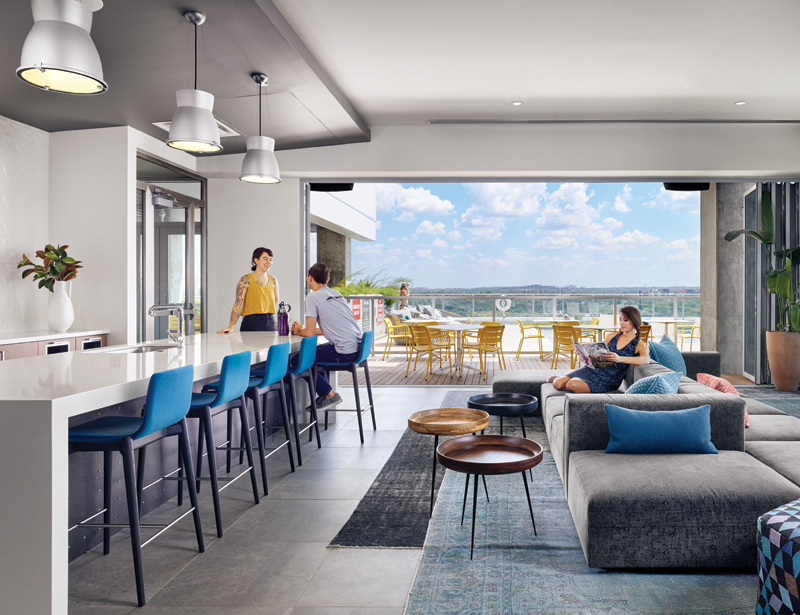 While construction was underway, Southwest, noting a pent-up demand, switched the tower apartments to condos. It turned out to be the right move. All of the tower’s 275 condos sold in 10 days, and by the time Southwest sold its interest in the project it was able to reimburse the city 100 percent of its investment. 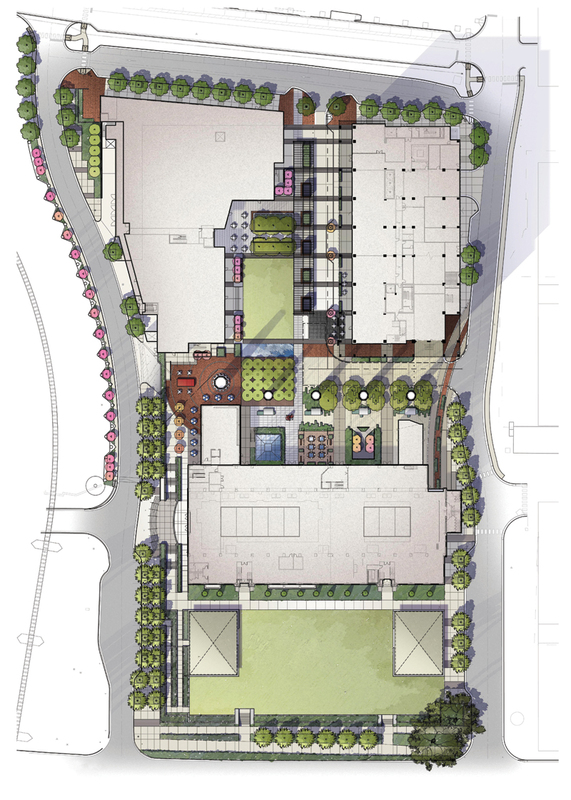 Architecturally, STG took cues from the language of the existing infrastructure in the design of the new buildings. The balconies on the 30-story, 615,000-sf tower respond to the patterning of the plant’s exhaust stacks. They also reused certain elements salvaged from Seaholm’s remediation and demolition, including placing old steel hatches, painted in bright colors, on the tower’s street face. The boilers on the north end of the turbine hall were selectively deconstructed, preserving the stacks and steel armature while opening this face of the building up to daylight and access. The new low-rise and high-rise buildings were pushed to the northeast and northwest corners of the site, opening up the center for a public plaza. In fact, all of the project’s pedestrian functions (residential, retail, restaurant, office) open onto this plaza, whereas the street frontages are automobile service-oriented (parking garages). The construction of the project, overseen by general contractor Flintco, was highly complex and involved a lot of coordination. Existing utility lines had to be moved and old infrastructure reused. The plant’s water weirs beneath Seaholm’s front lawn, for example, were repurposed as rainwater collection cisterns that are now used for site irrigation. 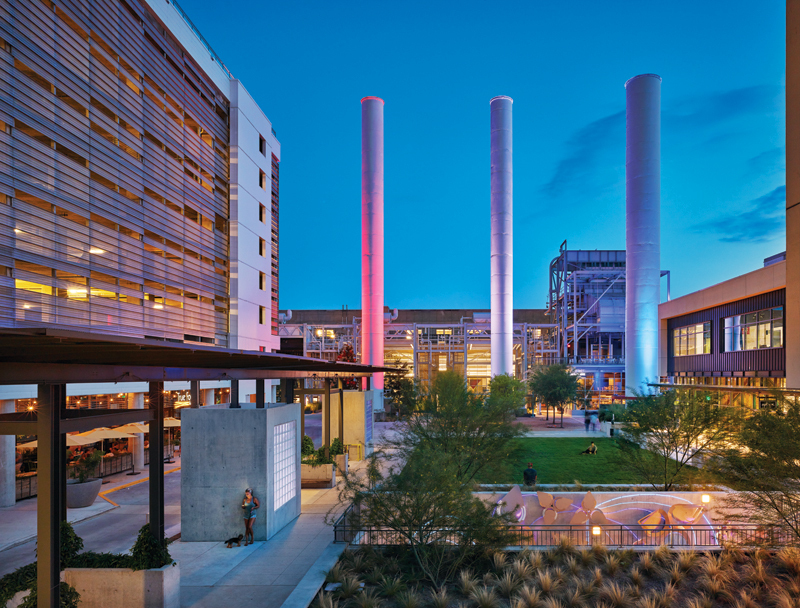 Excellent article – really enjoy seeing adaptive reuse of a decommissioned power plant into something new once more. It sounds like a great use of the site and surrounding views. Great article, Aaron. Unfortunately, the client wasn’t Southwest Strategies Group, it was Seaholm Power, LLC. As usual, some of those involved in the project want folks to think they were the only ones involved in the concept, financing, and development of the Seaholm Project.. As one of the active members of the partnership that spent 12 years redeveloping the property, that should be clarified.